Mato is our youngest horse in the barn. He was born in November, 2014 and although he technically just turned four a few months ago, he is now considered a five-year-old by the way that horses’ ages are usually counted by the spring foaling season. He arrived at Lancers last spring and happened to be on “vacation” already when our quarantine set in so he spent the summer “being a horse” which is not necessarily a bad thing for a young horse. Mato originally made his way to Nova Scotia from Germany and is a Knabstrupper- Frederiksborg cross. Although most Knabstruppers often have “leopard” or spotted coats, Mato is all black! It is from his colouring and our Harry Potter themed names for our horses that he earned his show name “Sirius Black”. While he likes all treats, it is fitting that he also loves black licorice. His colouring, although through happenstance, also harks back to the days when all Lancer horses were black. Mato has a level-head and our head coach works very closely with Mato and all his young riders as we develop this young horse. He is a fantastic lesson horse prospect and always tries to please his rider. He is extremely kind and greets everyone with his head over the door hoping to get lots attention. In a cheeky way, he does like to play with his stall guard (or other things that he can get in his mouth like reins!). He is already a barn favourite and certainly carries, as his name suggests, some magic with him. Mato has fantastically comfortable gates and carries his neck naturally high which gives him a different “feel” than some other horses. He has started his jumping career and while he might not yet be a fan of flowers, he likes to pop up and over jumps with enthusiasm. 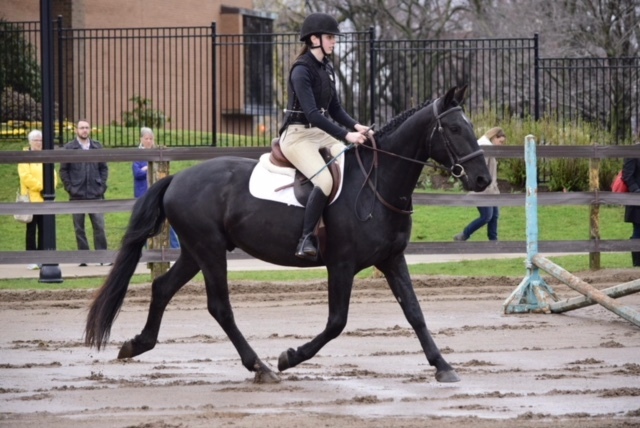 Mato has already participated in training shows, the Paul Halpern Jumper Clinic, and the Erin MacQuarrie Dressage Clinic and he is proving versatile and ever willing. Mato is the perfect young horse to teach our riders how to not only ride, but also train horses. We are excited about his future and all the things he and his riders will learn together in the coming years.